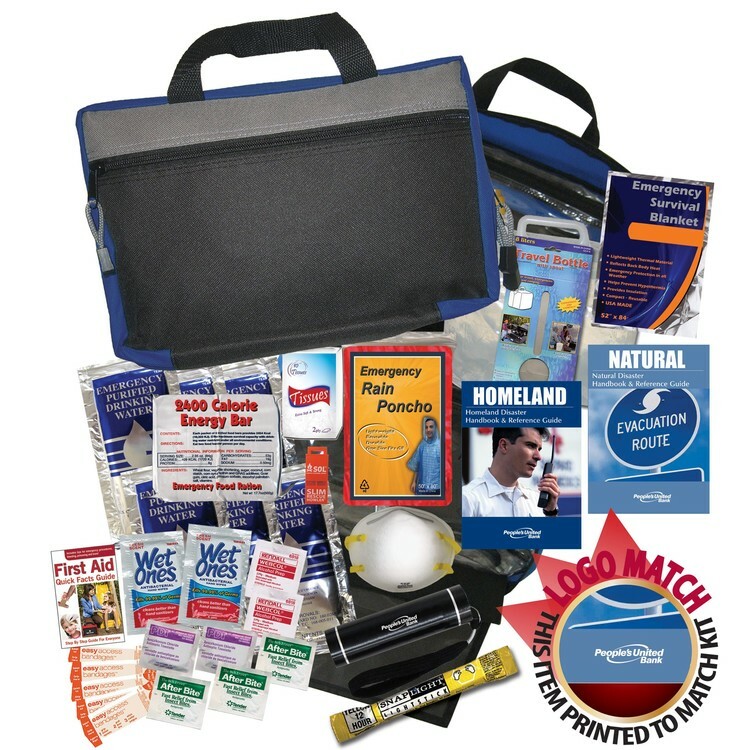 Show your customers and supporters that you mean business when it comes to disaster preparedness with this survival kit – wrapped up in a convenient but rugged 11” x 7” zippered nylon case. Add your organization or company logo to create a one-of-a-kind branded promotion for survival and sporting goods shows, seminars, or conventions. This kit includes 4 400 Calorie Energy Bars, 1 LED Flashlight w/ Batteries & Imprint, 1 48pg Homeland Security Guide w/ Imprint, 2 N95 Medical Grade Masks, 1 Emergency Whistle, 1 Multifunction Knife Tool, 5 Emergency Purified Water Pouches, 1 Emergency Blanket, 1 Lightstick, 1 48pg Natural Disaster Guide w/ Imprint, 1 Ice Pack, 1 Tissues Pack, 2 Wet Ones® Wipes, 20 Bandages, 3 After Bite® Sting Swabs, 1 First Aid Quick Facts Card, 2 Alcohol Wipes, 2 Antiseptic Wipes, 5 Gauze Pads, 1 Pair of Nitrile Gloves, 2 Knuckle/Fingertip Bandages, 1 ABD Super Absorbent Gauze Pad, 1 Finger Splint, 1 Tape Roll 1/2" x 5 Yards, and 2 Large Patch Bandages. Natural disasters and other emergencies strike quickly and often without warning. Keep yourself alive for two days in even the most adverse conditions for up to two days with this indispensable kit – all wrapped in an 11” x 7” zippered nylon case. Choose from red or blue, and add your organization or business logo to create a branded promotion that makes a dynamic door prize at a survival or sporting goods related show or event. This kit includes 1 2400 Calorie Energy Bar Pack, 1 LED Flashlight w/ Batteries & Imprint, 1 2.5 Gallon Water Bag, 6 Emergency Purified Water Pouches, 1 Emergency Blanket, 1 Lightstick, 1 48pg Natural Disaster Guide w/ Imprint, 1 48pg Homeland Security Guide w/ Imprint, 1 Emergency Whistle, 1 Rain Poncho, 1 N95 Medical Grade Mask, 1 Tissue Pack, 2 Wet Ones® Wipes, 5 Bandages, 3 After Bite® Sting Swabs, 1 First Aid Quick Facts Card, 2 Alcohol Wipes, and 2 Antiseptic Wipes. Fun in the sun, water or snow sometimes means minor injuries. Be prepared with this easy to carry kit. This 8.5" x 5.5" zippered nylon case has a rope loop and carabiner so you can hang it almost anywhere. Choose from four colors, and add your emblem or message to this kit to create an outdoor kit that keeps your brand in mind no matter the time of year. This kit includes 1 Premium Sunscreen Packet, 1 Tissue Pack, 1 Emergency Blanket, 1 Pair of Handwarmers, 1 Pair of Toewarmers, 2 After Burn Packets, 2 Blistex Packets, 3 Lens Wipes, 1 48pg First Aid Guide, 2 First Aid Burn Cream, 2 Wet Ones Wipes, 1 Tweezers, 5 Bandages, 3 After Bite Sting Swabs, 1 First Aid Quick Facts Card, 2 Alcohol Wipes, and 2 Antiseptic Wipes. The ePod 20-piece set will help you survive your next outdoor excursion. Includes BC7701 EPod (2 fishing hooks on line, 2 weights, 2 floats, a ferrous rod/fire striker, cotton fire tinder, an alcohol pad, tin foil, knife blade, whistle, paracord, 48” wire, 2 safety pins, and a needle), BC7803 carabiner tool, and a pouch to store it all in. Items not sold separately. 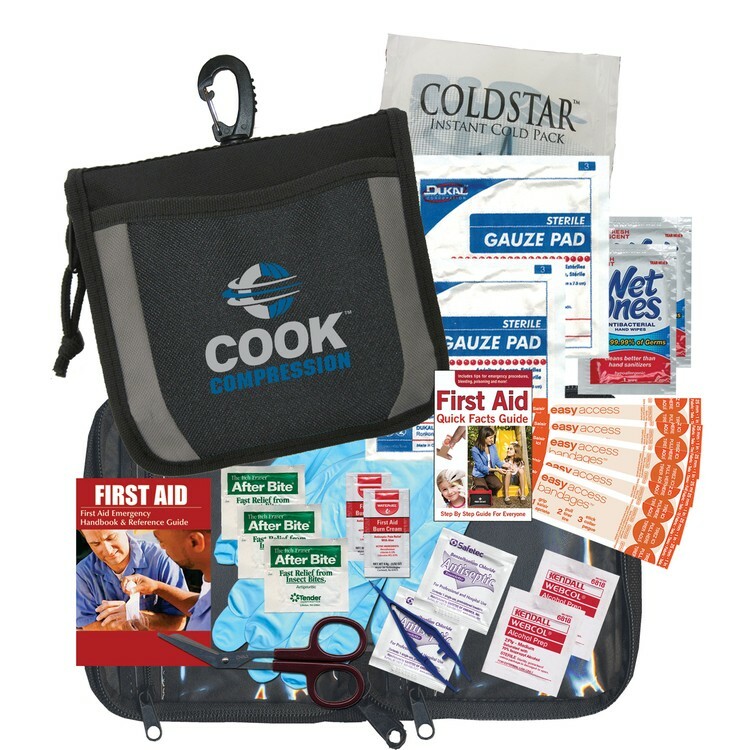 Meet customers' emergency needs when you give out this best-selling first aid kit! 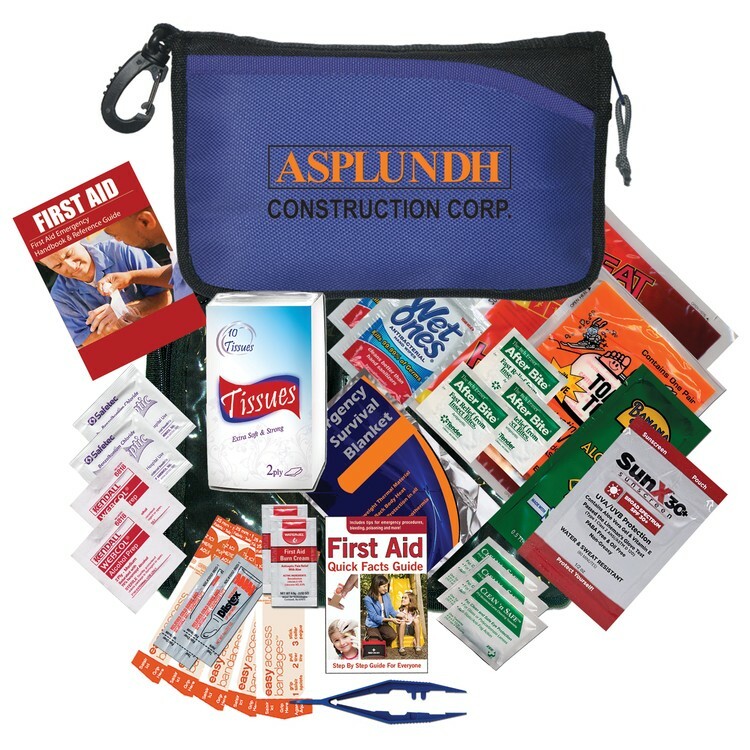 Add your brand name or logo to the pouch to make your brand known and associated with safety! 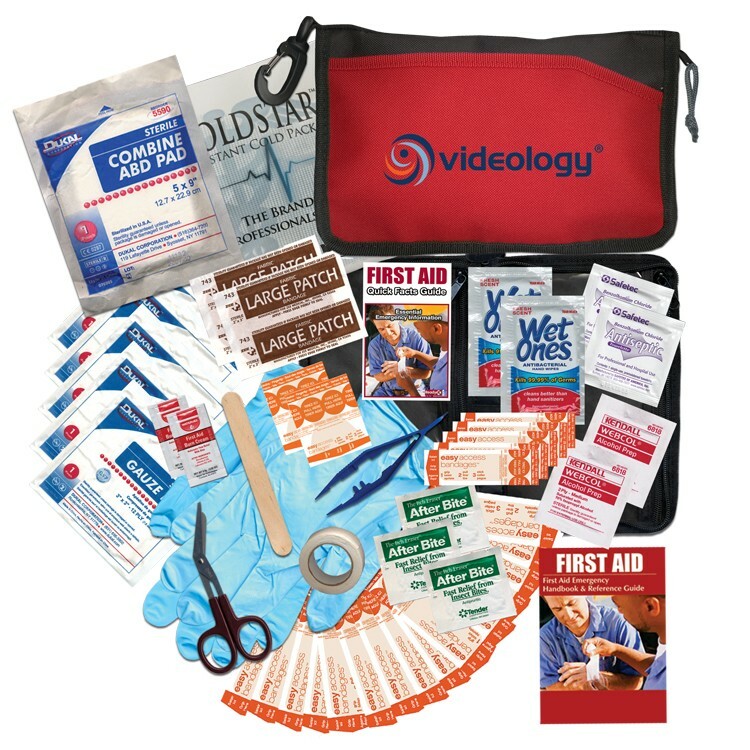 This kit includes 1 48pg First Aid Guide, 1 Scissors, 1 Ice Pack, 2 Wet Ones® Wipes, 1 Tweezers, 2 First Aid Burn Cream Packets, 20 Bandages, 3 After Bite® Sting Swabs, 1 First Aid Quick Facts Card, 2 Alcohol Wipes, 2 Antiseptic Wipes, 5 Gauze Pads, 1 Pair of Nitrile Gloves, 2 Knuckle/Fingertip Bandages, 1 ABD Super Absorbent Gauze Pad, 1 Finger Splint, 1 Roll Tape 1/2" x 5 Yards, and 2 Large Patch Bandages. 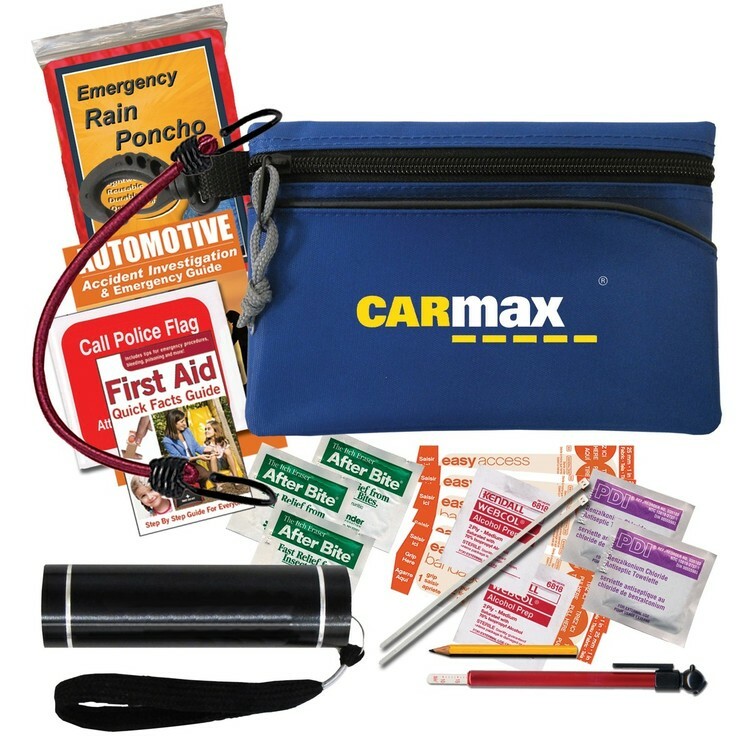 Be prepared for any unexpected automotive emergencies by carrying around this helpful auto kit in your truck or glove box. Choose from an assortment of case colors and customize each one with a silkscreen imprint showcasing your brand name or logo. Customers will think of your brand whenever they need help! 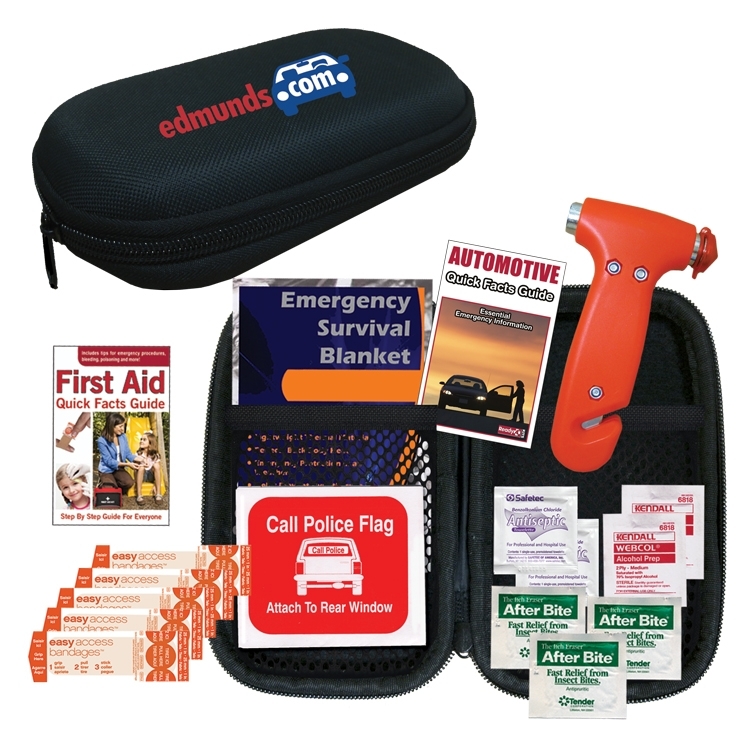 This kit includes 1 Emergency Window Hammer w/ Seatbelt Cutter, 1 Emergency Blanket, 1 Call Police Banner, 1 Auto Quick Facts Card, 5 Bandages, 3 After Bite Sting Swabs, 1 First Aid Quick Facts Card, 2 Alcohol Wipes, and 2 Antiseptic Wipes. 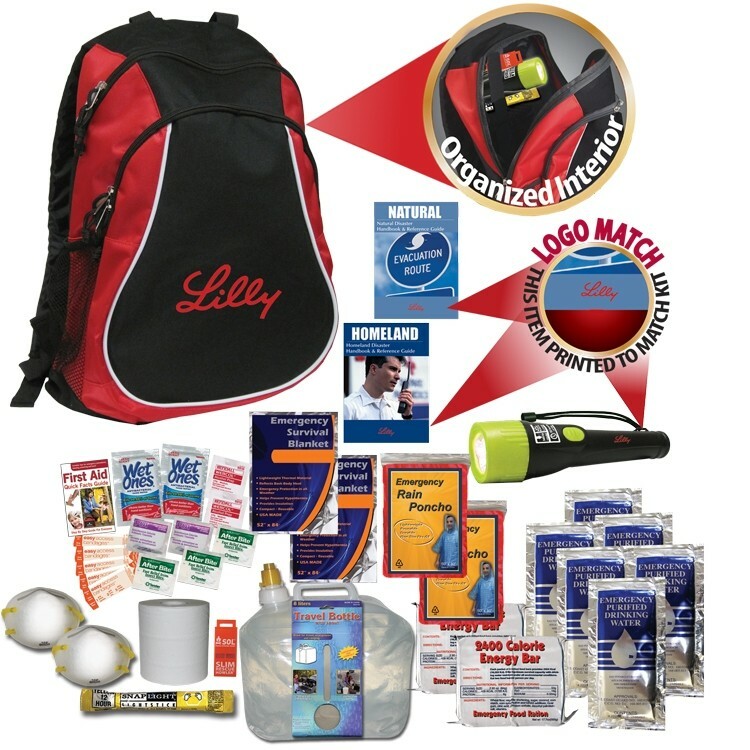 Be prepared each time you hit the road with this great auto kit. 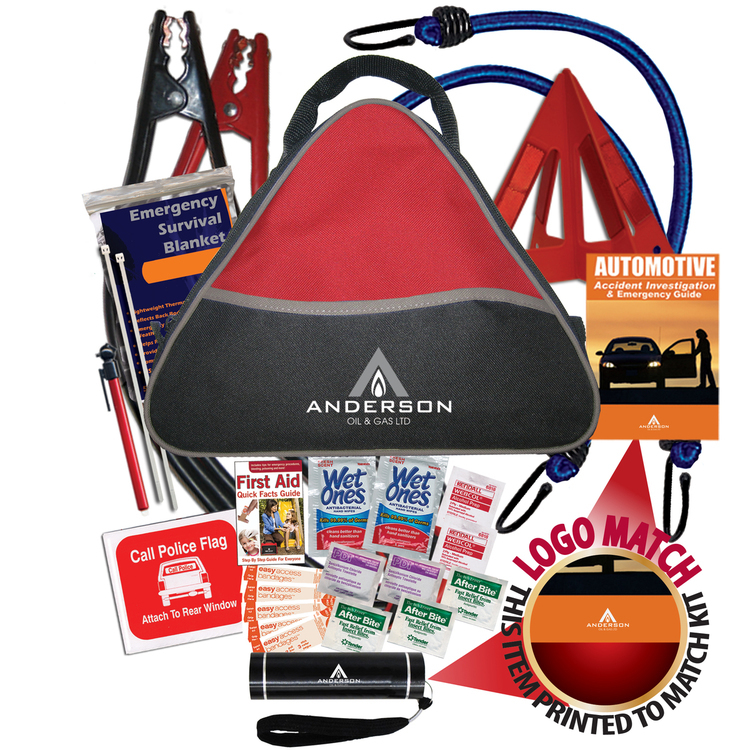 Choose from four bold colors, and add your organization or business logo or message to this kit to create a great branded premium that will bolster any trunk or glove compartment. 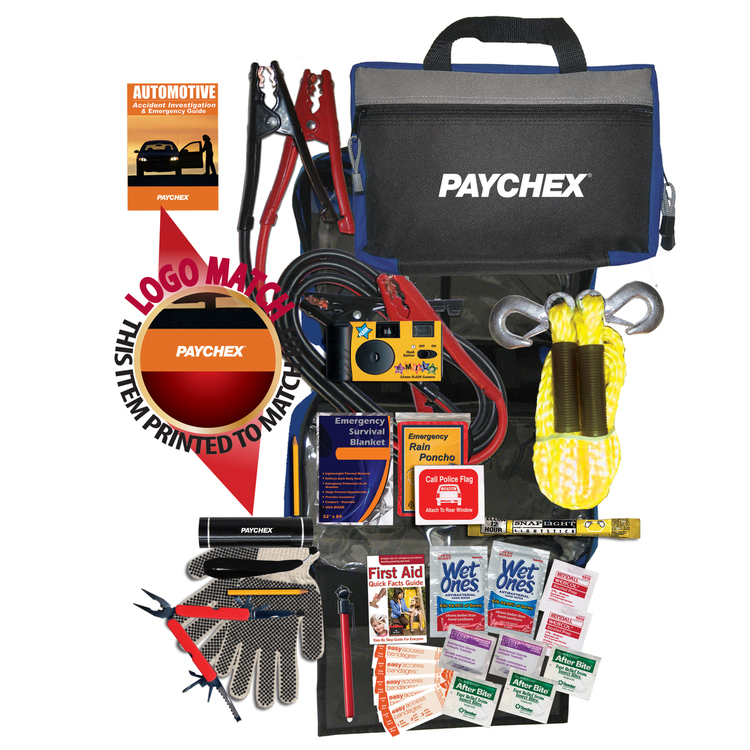 This item is a great giveaway for automotive trade shows, car safety seminars, and similar events. 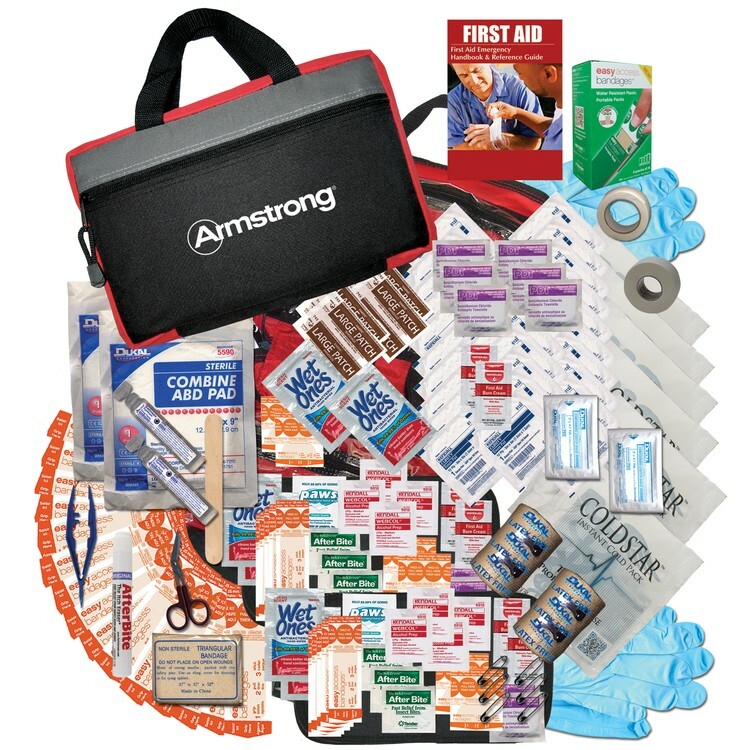 This kit includes 1 LED Flashlight w/ Batteries, 1 Bungee Cord, 1 Rain Poncho, 1 Tire Pressure Gauge, 2 Cable Zip Ties, 1 Call Police Banner, 1 Pencil, 1 48pg Auto Emergency Guide, 5 Bandages, 3 After Bite Sting Swabs, 1 First Aid Quick Facts Card, 2 Alcohol Wipes, and 2 Antiseptic Wipes. Don’t leave for that road trip yet – not without this indispensable automobile kit. This heavy duty kit is packed in a rugged 12” x 10” triangular nylon case. 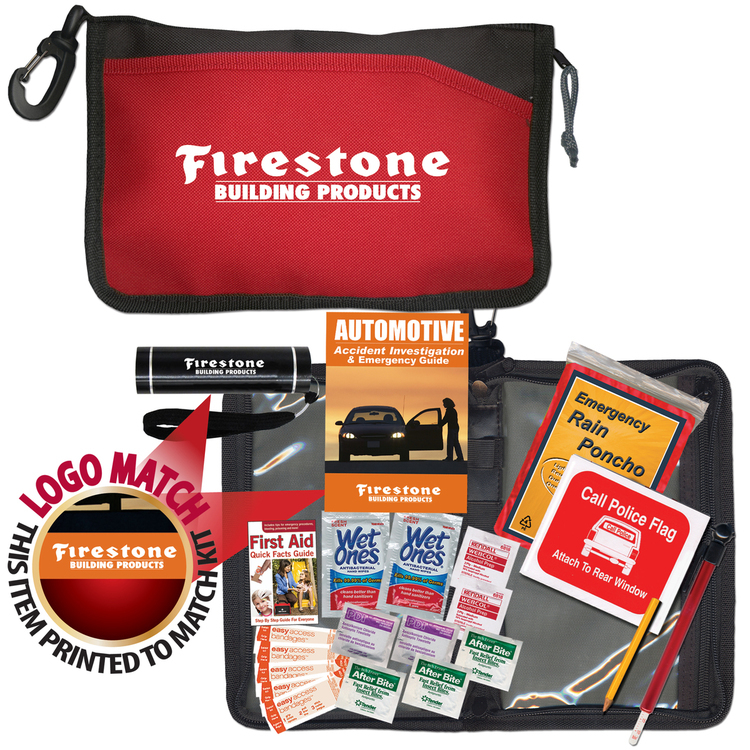 Choose from three colors, and add your organizational or business emblem or message to this kit to create a branded promotion that will shore up any trunk or glove compartment. Drive with confidence with this great kit. 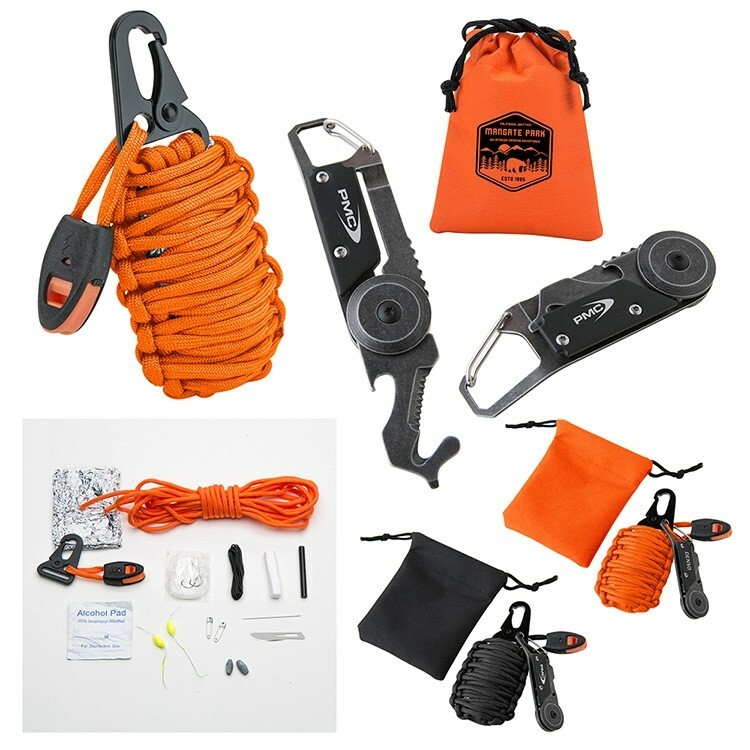 This kit includes 1 Pair of 250 AMP 10 Gauge Jumper Cables, 1 Safety Triangle, 1 LED Flashlight w/ Batteries & Imprint, 1 48pg Auto Emergency Guide w/ Imprint, 2 Bungee Cords, 2 Cable Zip Ties, 1 Tire Pressure Gauge, 1 Emergency Blanket, 1 Call Police Banner, 2 Wet Ones® Wipes, 5 Bandages, 3 After Bite® Sting Swabs, 1 First Aid Quick Facts Card, 2 Alcohol Wipes, and 2 Antiseptic Wipes. Has Old Man Winter got you and your car down? Don’t become broken down or stuck in cold weather with this seasonal auto kit. Choose red or royal blue and add your logo to help show your customers and supporters who’s boss this winter. 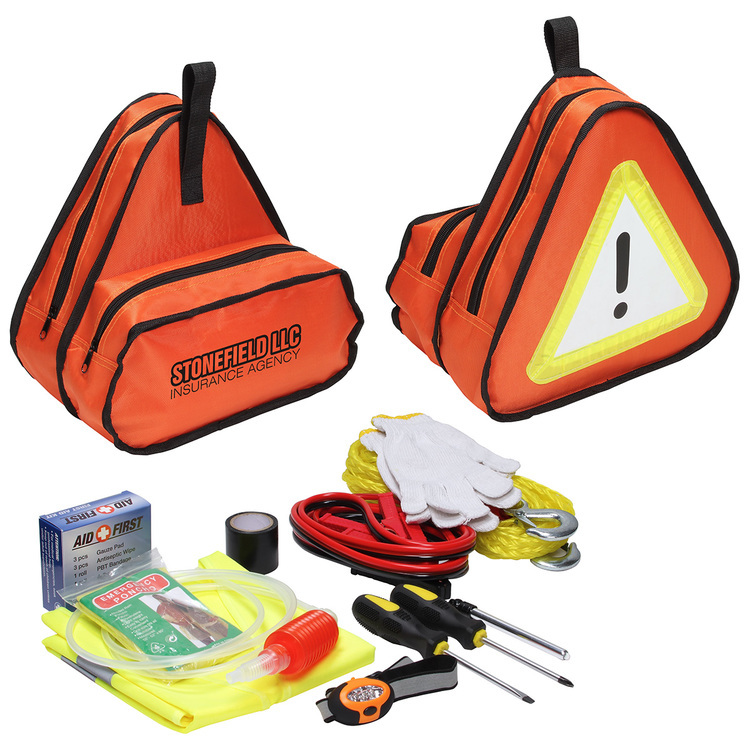 This kit includes 1 Pair 250 Amp 10 Gauge Jumper Cables, 1 LED Flashlight w/ Batteries & Imprint, 1 48pg Auto Emergency Guide w/ Imprint, 1 Safety Road Triangle, 1 Ice Scraper, 1 Tow Rope 8' 5" inches long, 1 Pair of Handwarmers, 1 Tire Pressure Gauge, 1 Pair of Cotton Work Gloves w/PVC Grip, 1 Emergency Blanket, 1 Call Police Banner, 1 Pencil, 1 Rain Poncho, 2 Wet Ones® Wipes, 5 Bandages, 3 After Bite® Sting Swabs, 1 First Aid Quick Facts Card, 2 Alcohol Wipes, and 2 Antiseptic Wipes. Premium Triangular polyester Zipper Tote with Reflective Triangle & back pocket includes: jumper cables (8ft, 10 gauge, 200 amp), full size flashlight, tire inflator, safety triangle, tire pressure gauge, distress flag, glow stick, rain poncho, emergency blanket, nitrile gloves, six wash-up towelettes, 19 pc first aid kit. 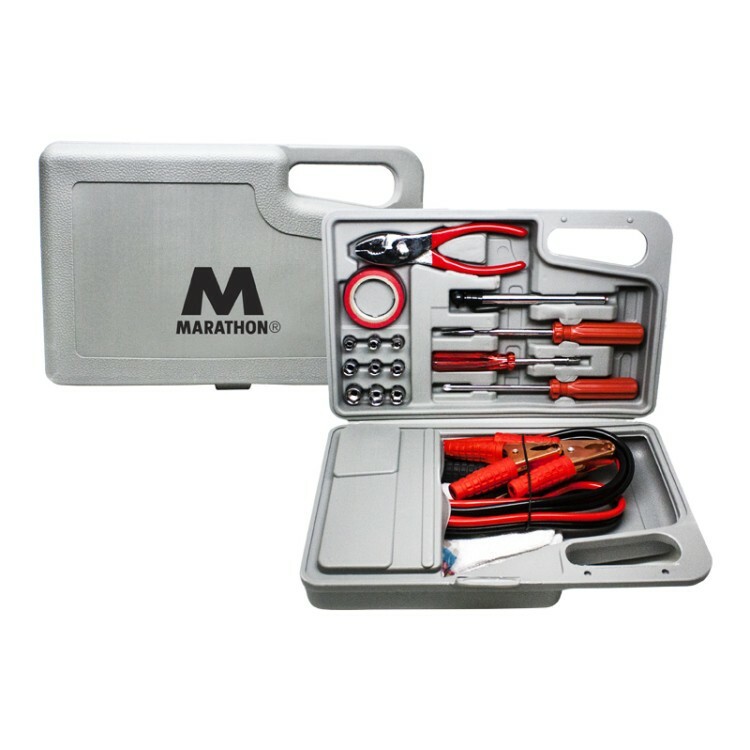 Your kit features: Emergency escape tool - 13 gauge jumper cables (5-3/4 ft long) - Tire gauge - Light with headband, clip and magnet - Gloves - Poncho - Bandages and alcohol pads - Jumper cables have a max capacity of 150 amps. Not to be used with any medium or heavy duty car batteries. 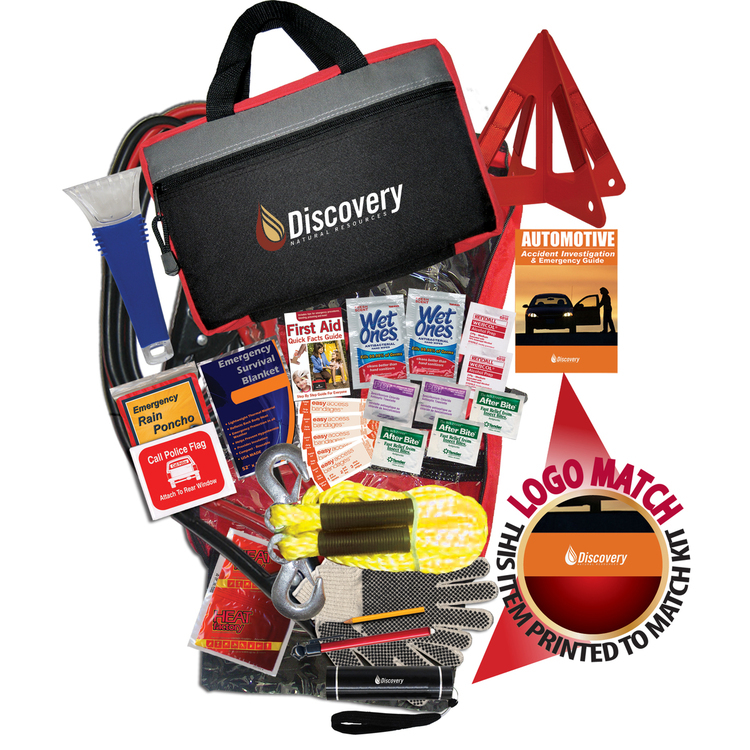 Go the extra mile when it comes to trade show or convention gifts with this ultimate deluxe automobile kit. Add your logo to create kit that’s there if you need it – even if you hope to never use it. 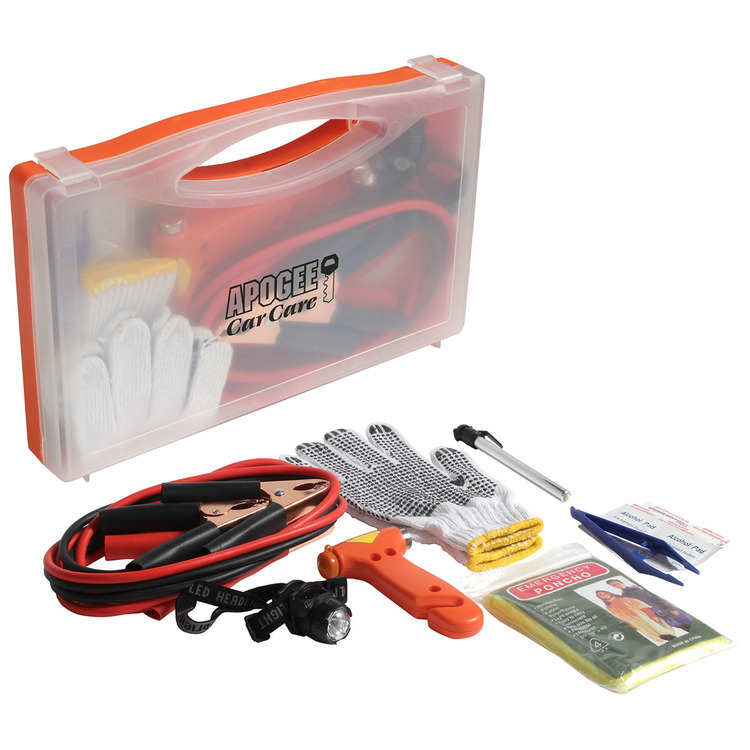 This kit includes 1 Pair of 250 Amp 10 Gauge Jumper Cables, 1 LED Flashlight w/ Batteries & Imprint, 1 48pg Auto Emergency Guide w/ Imprint, 1 Tow Rope 8' 5" inches long, 1 Multifunction Knife Tool, 1 Disposable Flash Camera, 1 Emergency Blanket, 1 Lightstick, 1 Pair of Cotton Work Gloves w/PVC Grip, 1 Tire Pressure Gauge, 1 Call Police Banner, 1 Rain Poncho, 1 Pencil, 2 Wet Ones® Wipes, 5 Bandages, 3 After Bite® Sting Swabs, 1 First Aid Quick Facts Card, 2 Alcohol Wipes, and 2 Antiseptic Wipes. The worst types of natural disasters and emergencies are the sorts that leave you displaced from home. 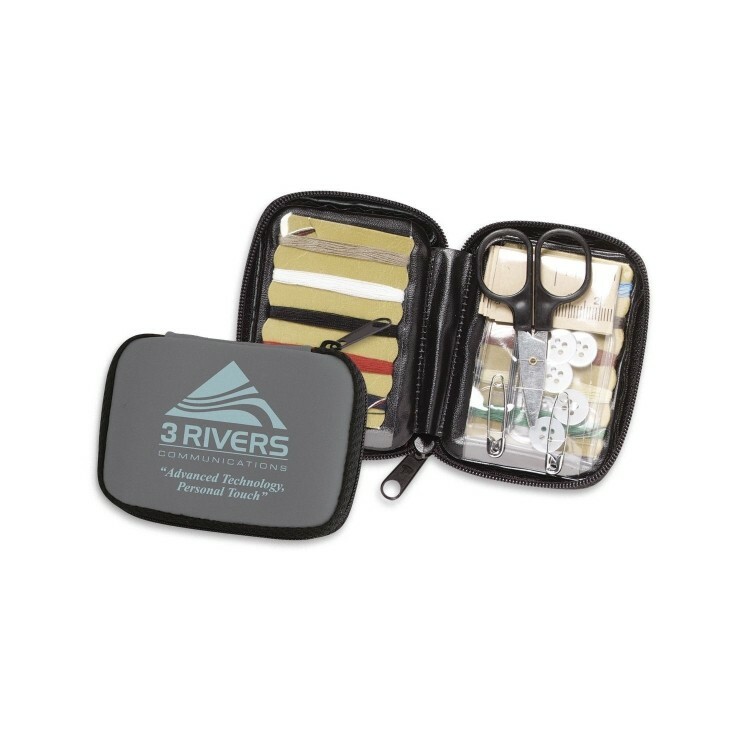 This rugged 12” x 7” nylon pack has all the essentials that should help two people survive for as many as three days. 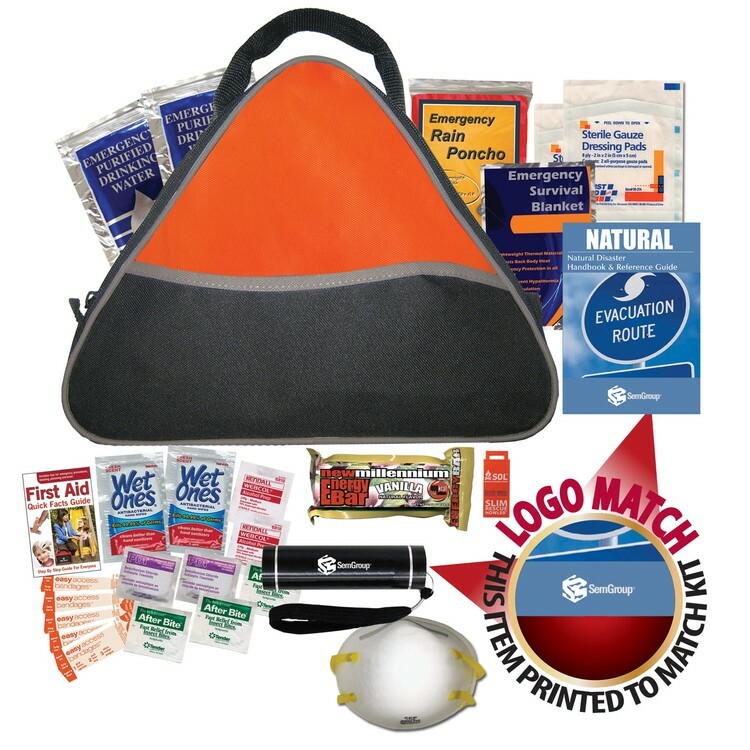 Add your organization or company logo to several items in this deluxe kit to create a dynamic item for camping, survival or sporting goods shows or expos. This kit includes 1 2.5 Gallon Water Bag, 2 Emergency Blankets, 1 LED Flashlight w/ Batteries & Imprint, 1 48pg Natural Disaster Guide w/ Imprint, 1 48pg Homeland Security Guide w/ Imprint, 6 Emergency Purified Water Pouches, 2 2,400 Calorie Energy Bar Packs, 1 Toilet Paper Roll, 2 Rain Ponchos, 2 N95 Medical Grade Masks, 1 Emergency Whistle, 1 Lightstick, 2 Wet Ones® Wipes, 5 Bandages, 3 After Bite® Sting Swabs, 1 First Aid Quick Facts Card, 2 Alcohol Wipes, and 2 Antiseptic Wipes. It's important to be prepared for the worst-case scenario, and this complete disaster kit is bound to come in handy in such an event. It’s all packaged in a sturdy 12” x 10” triangular zippered nylon case. 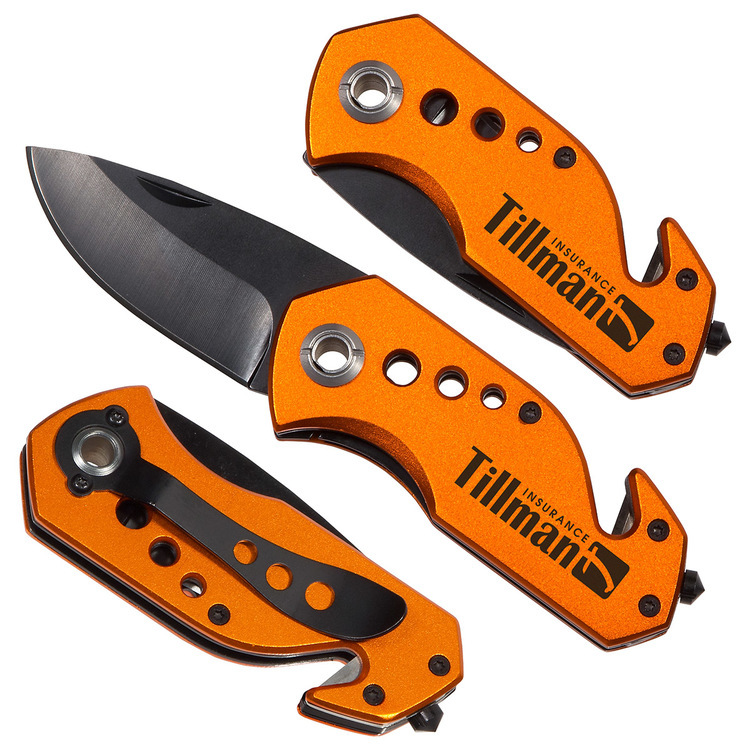 Choose from four colors and add your organizational or corporate emblem or logo to craft a dynamic branded promotion that makes a great giveaway at a camping, sporting goods or survivalist expo or convention. This kit includes 2 Sterile Gauze Pads, 1 400 Calorie Energy Bar, 1 LED Flashlight w/ Batteries & Imprint, 1 Emergency Blanket, 1 Rain Poncho, 2 Emergency Purified Water Pouches, 1 N95 Medical Grade Mask, 1 48pg Natural Disaster Guide w/ Imprint, 1 Emergency Whistle, 2 Wet Ones Wipes, 5 Bandages, 3 After Bite Sting Swabs, 1 First Aid Quick Facts Card, 2 Alcohol Wipes, and 2 Antiseptic Wipes. The 9-in-1 digital tire pressure gauge-Includes emergency tool and repair tools like window breaker, LED flashlight + red safety light make checking tire pressure even easier in the dark! Seat belt cutter, scissors, screwdriver and plier tire tread depth gauge that every cars need. The gauge can measure pressure ratings from 3 to 150 PSI, so it's ideal for checking tire pressure on any vehicle in all types of conditions. You can even measure in your choice of KPA, PSI or BAR, giving you the flexibility to check the pressure in the same measurement units that are used by your vehicle manufacturer. 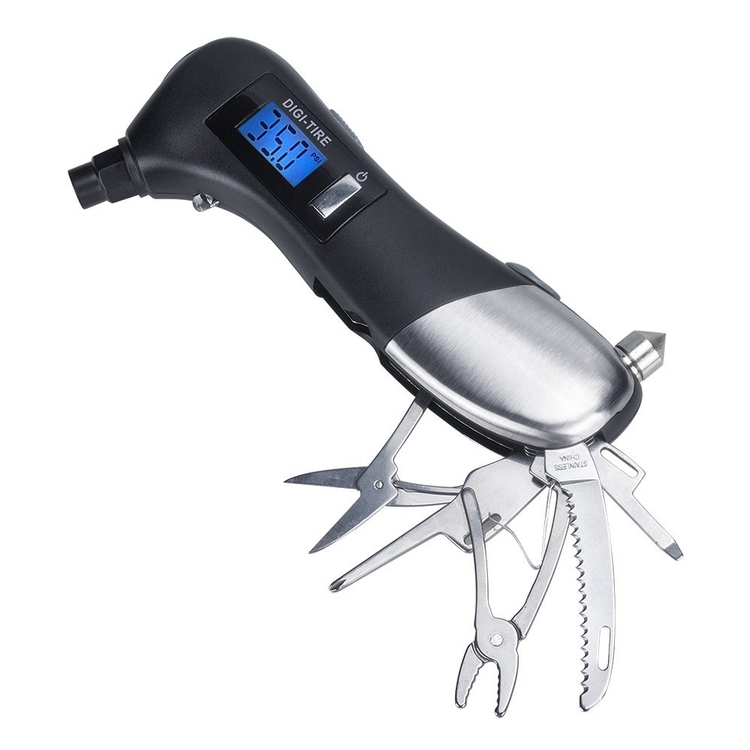 This compact size with the ergonomic design handy tool fits easily into any glove box or backpack. This a must have tool will give you a peace of mind while travelling on the road. Belle - Deluxe Travel Sewing Kit with full zippered suede-touch case. Kit contains scissors, shirt buttons, sewing needles, 10 colors of thread, needle threader, safety pins and a 25 long measuring tape. Size: 3 3/8 x 2 1/2 x 5/8 case. 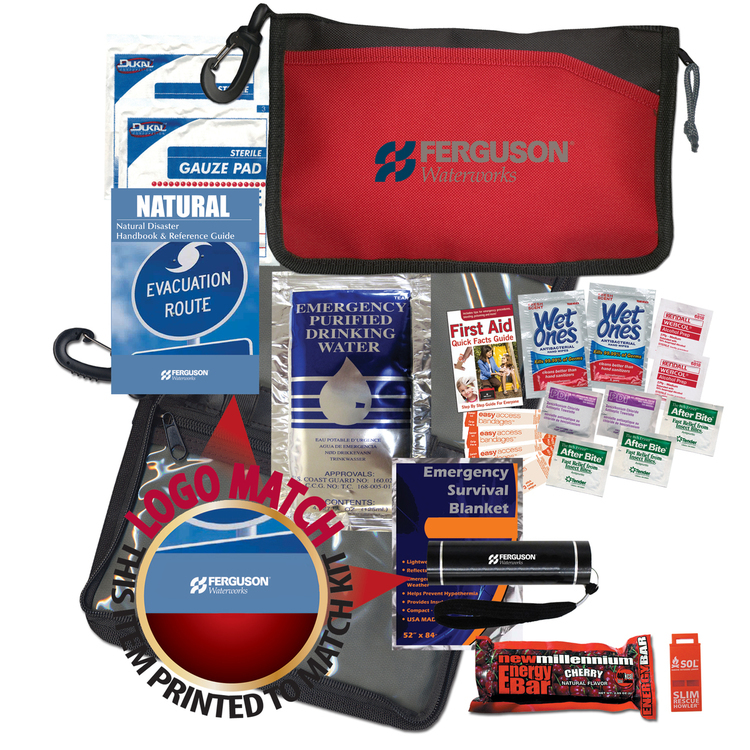 Generate a brand buzz with this customizable technical first aid kit! Packed inside a rugged, 3-tone nylon bag, recipients will find everything they need in case of an emergency. This kit includes 1 Triangular Bandage, 2 Gauze Rolls, 3 Pairs of Nitrile Gloves, 6 Wet Ones Wipes, 1 ABD Super Absorbent Gauze Pad, 6 Iodine Wipes, 1 After Bite Sting Stick, 6 Safety Pins, 4 Large Patch Bandages, 1 48pg First Aid Guide, 1 Roll Tape 1" x 10 Yards, 1 Scissors, 1 Tweezers, 1 Box of 60 Assorted Bandages, 6 First Aid Burn Cream Packets, 10 Antiseptic Wipes, 2 – Elastic Bandages, 20 Gauze Pads, 2 Eye Wash Vials, 6 Ice Packs, 25 Bandages, 6 Knuckle/Fingertip Bandages, 8 Alcohol Wipes, 6 After Bite® Sting Swabs, 4 p.a.w.s®Hand Wipes, 1 Finger Splint, and 1 Tape Roll 1/2" x 5 Yards. 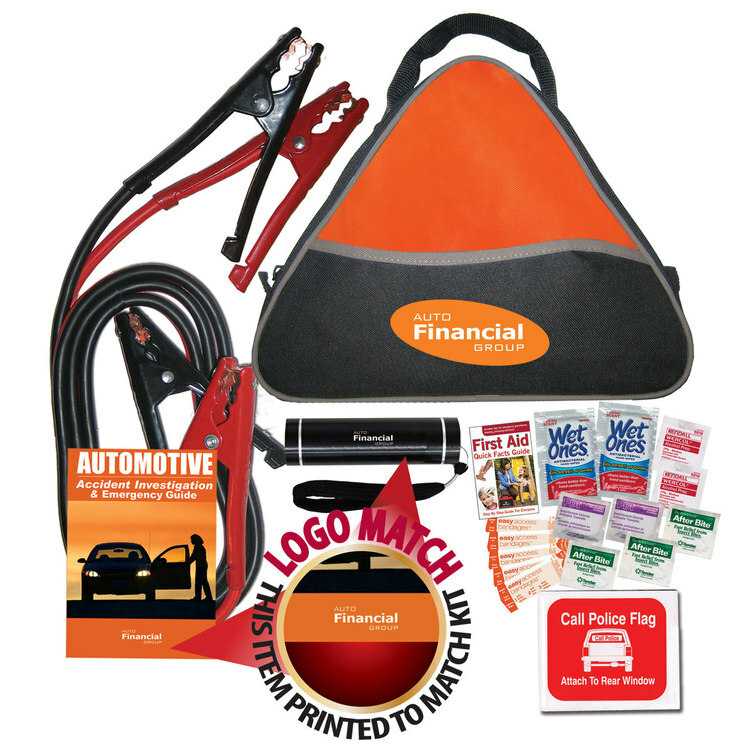 Keep yourself and your car together while you’re on the highway with this valuable auto kit. It’s all contained inside this rugged 600 Denier 8.5” x 5.5” zippered bag that you can hang by the loop or attached carabiner clip. Choose from four colors and add your company or group’s emblem or logo to create a branded campaign that will get your customers and supporters’ cylinders clicking. It’s a great option of car shows, dealers and more. 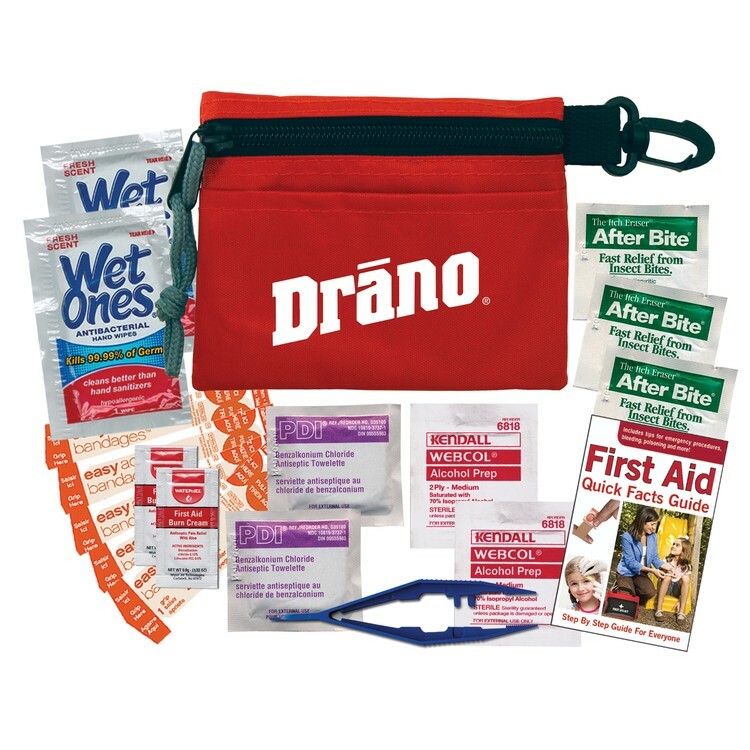 This kit includes 1 LED Flashlight w/ Batteries & Imprint, 1 48pg Auto Emergency Guide w/ Imprint, 1 Tire Pressure Gauge, 1 Call Police Banner, 1 Rain Poncho, 1 Pencil, 2 Wet Ones® Wipes, 5 Bandages, 3 After Bite® Sting Swabs, 1 First Aid Quick Facts Card, 2 Alcohol Wipes, and 2 Antiseptic Wipes. 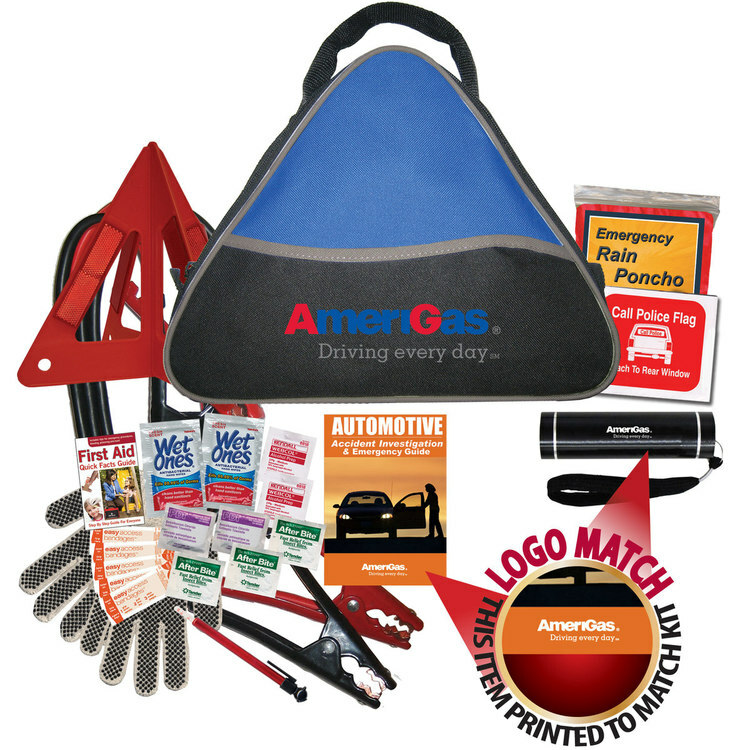 Hit the gas on your next branded promotional campaign with this deluxe automobile set. This is a set that drivers will love and will be at home in any trunk or back seat. Choose a color and add your company or organization logo to build a premium that has real speed. 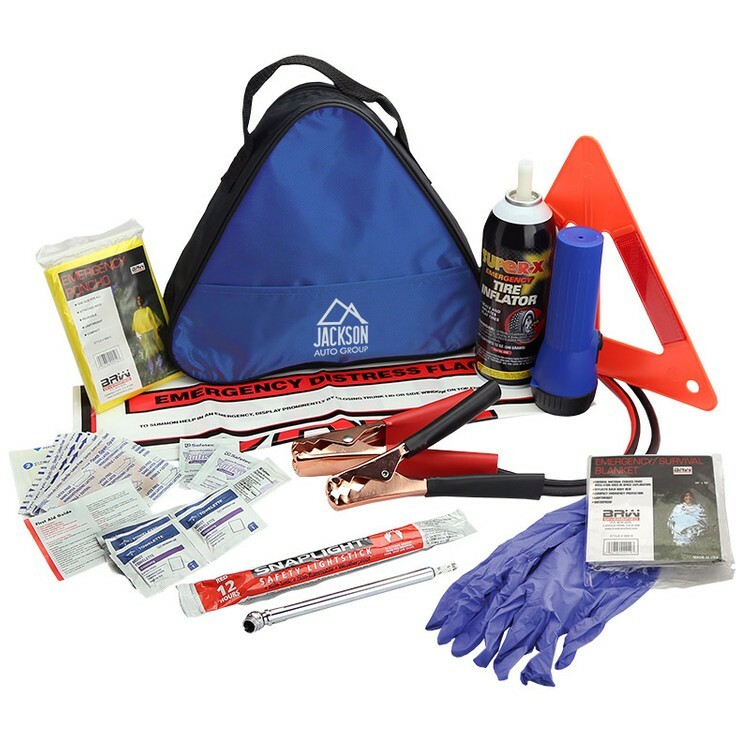 This kit includes 1 Pair of 250 Amp 10 Gauge Jumper Cables, 1 Safety Road Triangle, 1 LED Flashlight w/ Batteries & Imprint, 1 48pg Auto Emergency Guide w/Imprint, 1 Pair of Cotton Work Gloves w/PVC Grip, 1 Tire Pressure Gauge, 1 Rain Poncho, 1 Call Police Banner, 2 Wet Ones Wipes, 5 Bandages, 3 After Bite Sting Swabs, 1 First Aid Quick Facts Card, 2 Alcohol Wipes, and 2 Antiseptic Wipes. This small and stow-able preparation kit provides a bit more than an ounce of prevention. 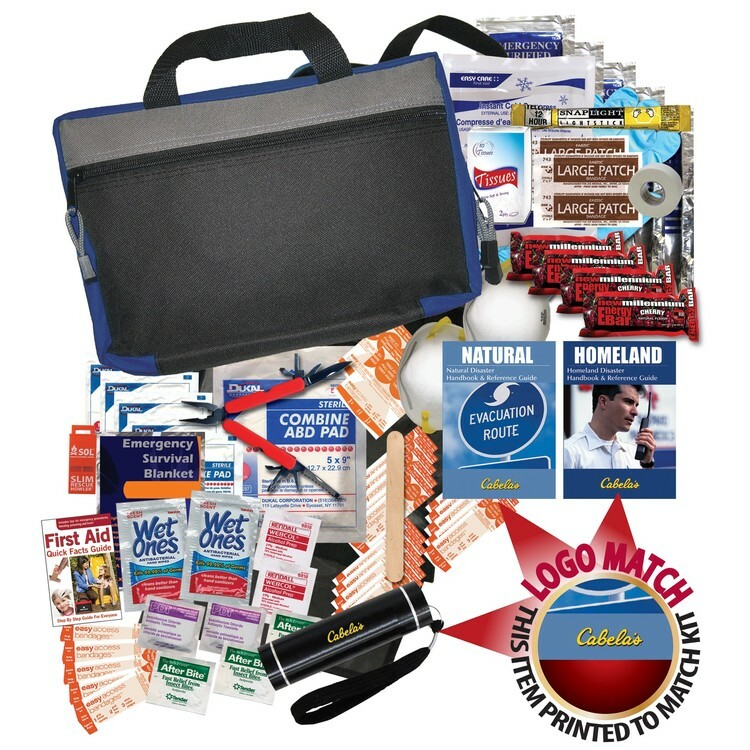 Available in blue only, just add your organizational or corporate emblem, design or message to this kit through our silkscreen method to create a great branded kit that slips into a drawer, purse, briefcase or glove compartment. 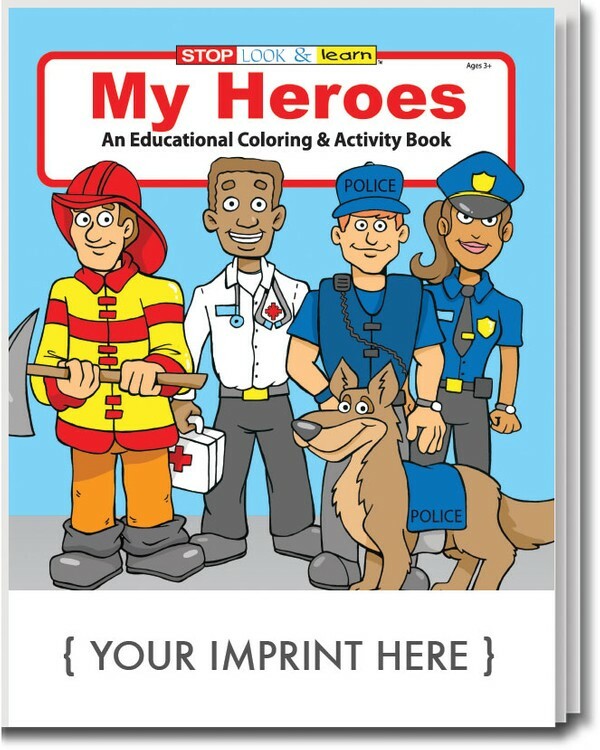 A great giveaway for health and safety fairs, expos and other events. 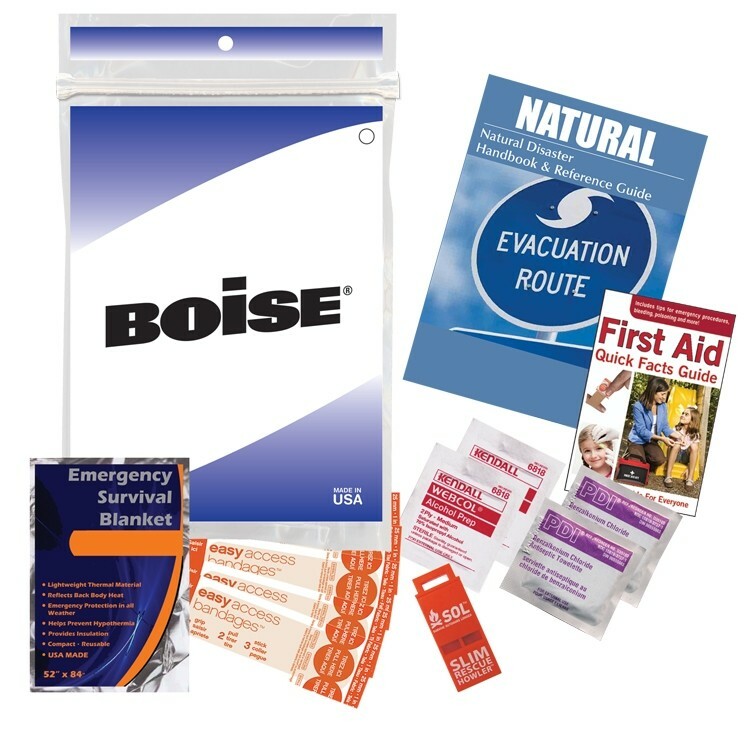 This kit includes 1 Emergency Blanket, 1 48pg Natural Disaster Guide, 1 Emergency Whistle, 5 Bandages, 1 First Aid Quick Facts Card, 2 Alcohol Wipes, and 2 Antiseptic Wipes. Whether your family is struck by a natural disaster or unpredictable emergency, preparedness is key. Offer your customers and supporters this deluxe kit. This 8.5" x 5.5” zippered nylon bag has a rope loop and carabiner clip for easy storage on a hook, shelf or glove compartment. This kit is OSHA and Coast Guard approved, and perfect for the workplace. Choose a color and add your emblem to create a valuable promotion that makes for a potent and indispensable giveaway at your next seminar or tradeshow. 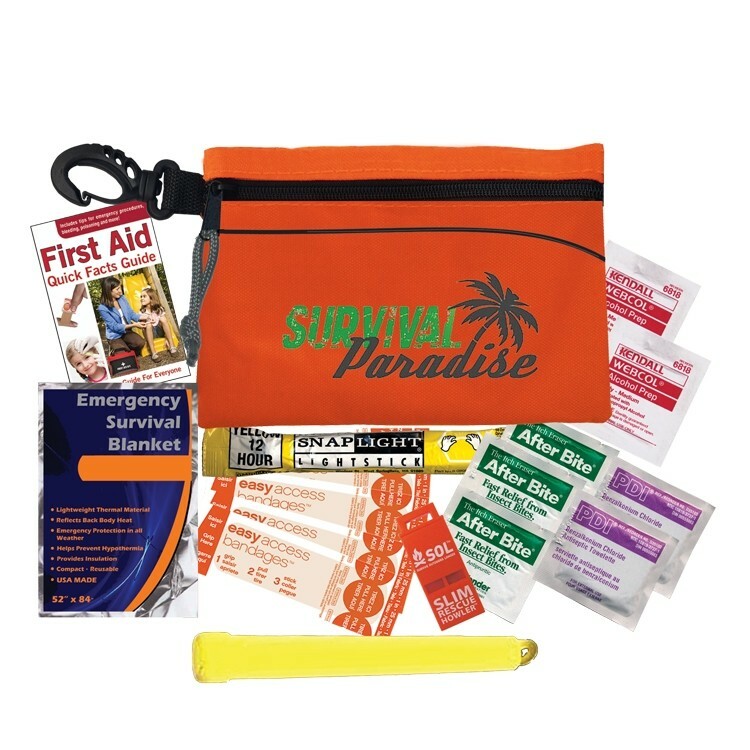 This kit includes 1 400 Calorie Energy Bar, 1 Emergency Purified Water Pouch, 1 LED Flashlight w/ Batteries & Imprint, 1 Emergency Whistle, 1 48pg Natural Disaster Guide w/ Imprint, 2 Gauze Pads, 1 Emergency Blanket, 2 Wet Ones® Wipes, 5 Bandages, 3 After Bite® Sting Swabs, 1 First Aid Quick Facts Card, 2 Alcohol Wipes, and 2 Antiseptic Wipes. 29 piece roadside emergency kit in durable storage case. Includes booster cables, gloves, tire gauge, socket handle, flathead screwdriver, phillips screwdriver, pliers, vinyl tape, four auto fuses, terminals and socket sets. Decoration: W 5" x H 3"